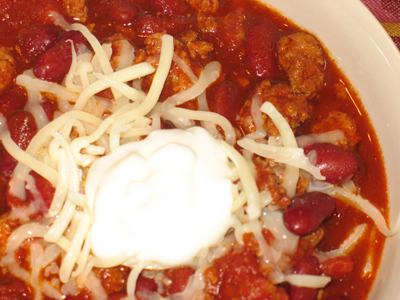 This chili is a crock pot mod of a recipe we’ve made for years, and it goes great over rice, nachos or just all by itself in a bowl. It does produce a good amount of liquid, so just make sure you use a slotted spoon when you get it out of the crock, if you’re putting it on nachos. This recipe also has the nice distinction of being pretty easy to make; you can also brown the turkey meat the night before and just put it in the fridge so that the prep that morning is just a matter of putting stuff in the crock and stirring well. Easy is good. Easy is your friend. Easy and tasty is just…SO NICE. 1. Brown ground turkey – this can be done the night before and then just stuck in the fridge if you want to spare the time in the morning. Drain any fat before storing or putting in the crock pot. 2. Add the turkey, beans (with liquid), tomatoes (with liquid), tomato sauce, chili powder and garlic powder to a 4qt crock pot; stir well to combine. 3. Cook on LOW for anywhere from 8-12 hrs. 4. Serve over rice, or in a bowl on its own (or nachos, because OMNOMNOM), with optional toppings if you so desire. This entry was posted in crock pot cooking, entrees and tagged cooking, crock pot, crockpot by crunchymetromom. Bookmark the permalink.